Delphine’s is currently offering one Block of the Month; Enchanted Garden from In the Beginning Fabrics. Prices for Block of the Month Programs are per month (shipping is extra) for the duration of the program. No cancellations will be allowed. You must sign up using a credit card. After the initial deposit, your card will not be charged until the fabric is shipped out to you each month. Enchanted Garden Block of the Month featuring "Floragraphix Batiks IV" by Jason Yenter for In the Beginning Fabrics. This BOM is currently underway. 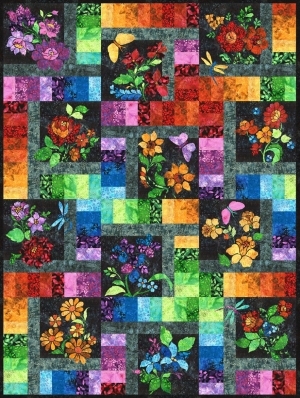 While it is too late to join as a "Block of the Month", kits for the entire quilt top are available for $139.99. These kits include patterns and all fabrics needed to complete the top and binding. NOTE: These are NOT precut laser-fused applique pieces. The finished quilt is approximately 48 1/2" x 64 1/2" quilt.